ERP systems and provide solutions which help businesses achieve control and visibility of day to day business operations. MYOB EXO, an ERP system which includes an extensive range of business management solutions for medium and larger businesses. MYOB EXO is a flexible integrated and customisable system that can be configured specifically to your business. MYOB EXO helps you define your business processes, build your system around them and deliver real, quantifiable business benefits. Gain a deeper visibility of your performance using a wide range of customisable dashboards and reports within MYOB EXO. MYOB Exo Business provides a complete and rich set of accounting inventory control, analytics, sales and purchasing management. MYOB Employer Services provides a complete HR solution for medium sized and larger businesses. This report is based on the payment date for both customer and supplier and matches with the Bank GL Movements for the selected period. Map your Exo customers with Google Maps. This handy little add-on incorporates Google Maps directly into the Exo Debtor screen. Mobile Application for MYOB EXO to allow staff on the road to be able to look up EXO customers and EXO suppliers using a phone or a tablet, including Android and Apple iPad iOS. This mobile Web App uses live EXO data, so it is always up-to-date. The Acacia Stocktake Web App is a Web application that allows warehouse stocktaking to be performed using a mobile device with option support of a barcode scanner. 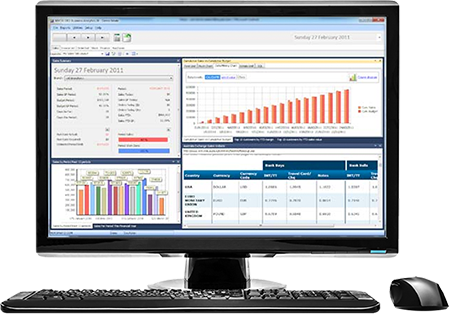 The simPRO2EXO Interface is used to synchronise standard accounting data from simPRO to MYOB EXO as a one-way only synchronisation. The download from simPRO can be manually initiated or scheduled using command line options if required. Jobcost Time Clock is a PC based time clock for EXO Jobcost. It allows employees to clock on or off EXO Jobs and idenitify the job task (EXO Labour code). Time is derived from the MS SQL Server ito ensure all time clocks are synchronised. Knowing that they’re there, and they’re so capable makes a big difference. EXO stood out for two reasons in particular, it’s reporting capabilities – specifically for invoice financing – and its ability to flex and change as the business grew. MYOB EXO has enabled us to seamlessly link our warehouse system to our accounting system reducing the need for the duplicate entry of data. This has vastly improved our paper flow and enabled us to have more timely and relevant management reporting all from the one database. EXO has made business life a whole lot easier for the company. Invoicing is clearer. We now have real time data and additional custom product data. We can provide reporting to our management and sales teams. Acacia have gone above and beyond on supporting our business, particularly during software transitions, and hardware breakdowns. Always have a speedy response to queries answered and problems rectified. Acacia have a support skill that from reading many EXO customer blogs, cannot be found in other EXO Business partners.